Every year, emerging from the depths of long dreary season, tired of wearing mostly blacks, I have been obsessing about bold flower prints. Best rendered in floaty silks and soft jerseys, they immediately signal a warmer, sunnier outlook and make me dream of vacations and travelling to happy places. However, I know from the experience that bold flower prints can be tricky when you are not a one of those willowy young things, perfectly positioned by pristine pools in exotic locales. I do adore those floaty, dreamy dresses that make you think of strolling, basket in hand, in the colorful countryside. They magically make me simultaneously look for the straw hat and an electronic wallet. But burned by numerous hard crashes with the merciless reality of a full size mirror, I come to think that a little flower top may be a safer option for me. This little flower number by Joie is sheer perfection, albeit not actually sheer, which is great (and rare!). I am no seamstress, mind you, but it looks beautifully made and the print itself is gorgeous and makes even the YouTube kittens jealous of attention. The V-neck is not too deep but it does create a leaner, sexier silhouette and the elastic at the bottom makes it stay put while camouflaging my, ahem, not so flat, stomach. I feel like I am often lured and then quickly betrayed by those bold colorful designs, as they can look great on models and in the magazines but often end up looking frumpy and visually add pounds and inches when worn by mere mortals, aka yours truly. There is a fine line here between a fresh feminine charm and something better left in grandma's closet or worse yet, best suited for some prepubescent hippie Lolitas. I want to think it works here but I have been wrong before and got pictures to prove it. How about you? Are you attracted to all this flower power or does it leave you cold and shaking your head? Do you think those prints can be wrapped over chests and hips or better left hanging around windows or draping the tables? A you know me I love a flower print! However I have found that those jersey floral dresses I bought never ended up being worn. 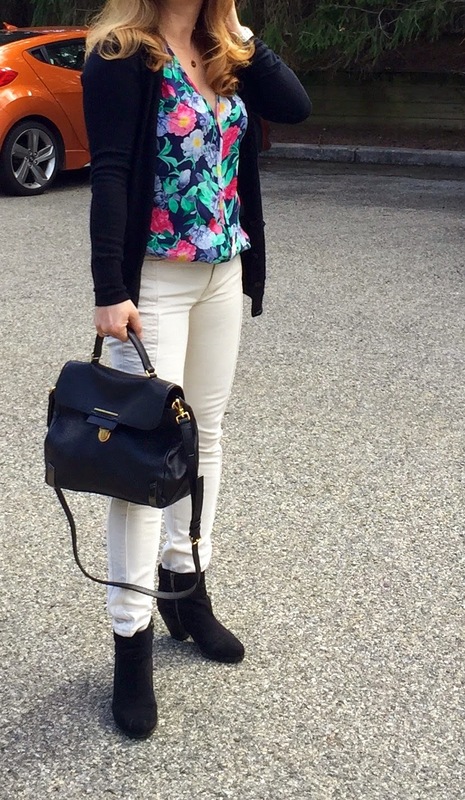 This top is a perfect way to wear a floral but still look modern and spring like, I love it. I'm trying to stick to tops or scarves to feed my floral fetish, and I'm wearing mostly solid colours as anchors these days. Oh Dani, yes I have been thinking of you and your Brora dresses, but you can pull them off you have a figure for it. I have been all about solids too but you know, when you wear all solids a little bit of print goes a long way. I have a huge basket of floral scarves, I wear them all the time, sometimes even around the house. I love flowers too. But, IKWYM. This is the first season I have started to wonder if I am at an in between age for florals. But, then I talk myself out of that: ) I think the key to floral prints is the fabrication. They are lovely when done right. Your blouse looks great, especially with that outfit. The boots are so chic. you are always so right about the fabric but that has been my demise with Joie, there are lovely and its hard to resist. I love those boots, I feel like they instantly amp up any outfit! That's when you know you got your money's worth! Lured and betrayed is the perfect way to describe me and florals. More than a few have been gotten rid of. I have been sticking to florals in floaty silk tops. I love that top. I love Joie! I am thisclose to ordering a Joie seethrough lace blouse I tried on in NYC. It is calling my name. It needs a tank underneath, but it was glorious!!! I am trying to stick to scarves for my florals - they seem to wear me, so I can completely relate! Thank you Kate, nice to see you guys!